Posted by Jenny in Civil War, history, military history. When I think about Shiloh, one thing always stands out to me among the countless assorted multicolored bits which that large event radiates out. 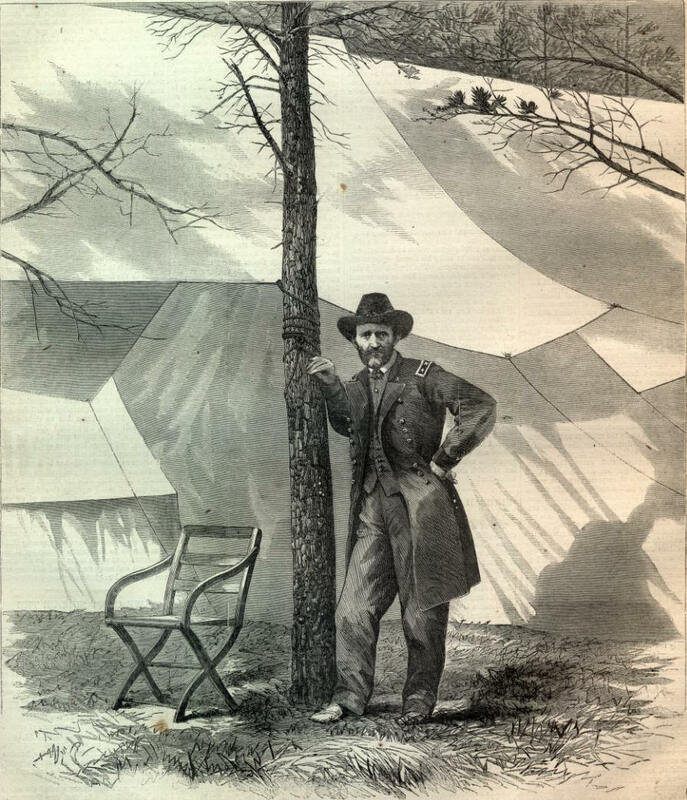 It is the phrase, “the trees were full of music.” It comes from the writings of a youthful Union soldier named Jesse Bowman Young, describing the morning of April 6, 1862. Within minutes, the music had given way to the dismembered sounds of shouts and screams—the sounds of “a terrible battle fought between great armies,” as Grant described it. Or, as Homer said in the Iliad, Dawn in her saffron robe came spreading light on all the world. I am trying to triangulate. If I take the map of the battle, with its white and black rectangles that represent troop positions, and then I take a few words that describe a moment for one individual in the battle, I will arrive at the junction of the objective and the subjective, and I will come closer to understanding the battle. I also add in my own private question, which I ask even though it involves something impossible in both time and circumstance. 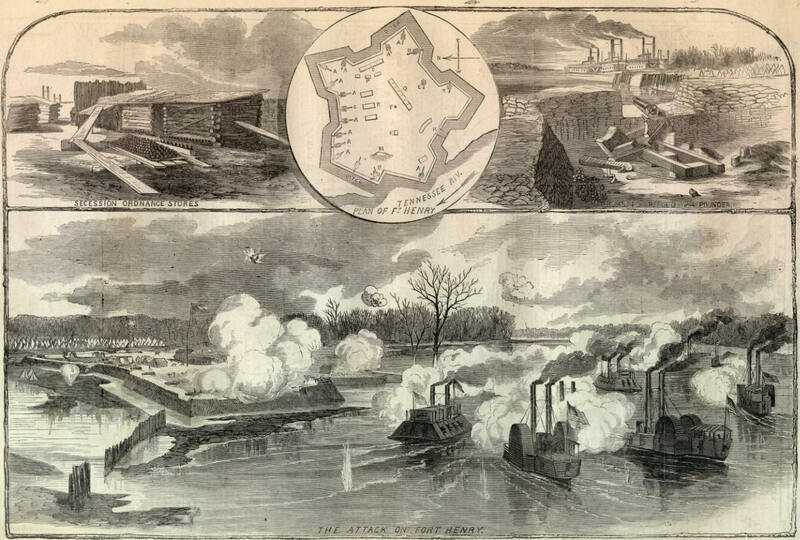 If I had been standing near Jesse Bowman Young that morning, when the massive unexpected charge of rebel soldiers came crashing through the woods, would I have stood my ground and fought, or would I have fled with the thousands of stragglers who cowered under the sheltering bluff of the Tennessee River? Certain major historical events come with a controversy attached as a sort of bonus, and Shiloh is one of them. Shiloh is permanently linked to the question: Did Grant fail to anticipate and prepare for a rebel offensive that morning? If the question is rephrased, it has a definite answer: In hindsight, would Grant have done anything differently? Yes, he would have made his troops dig entrenchments. That would have saved many Union lives. 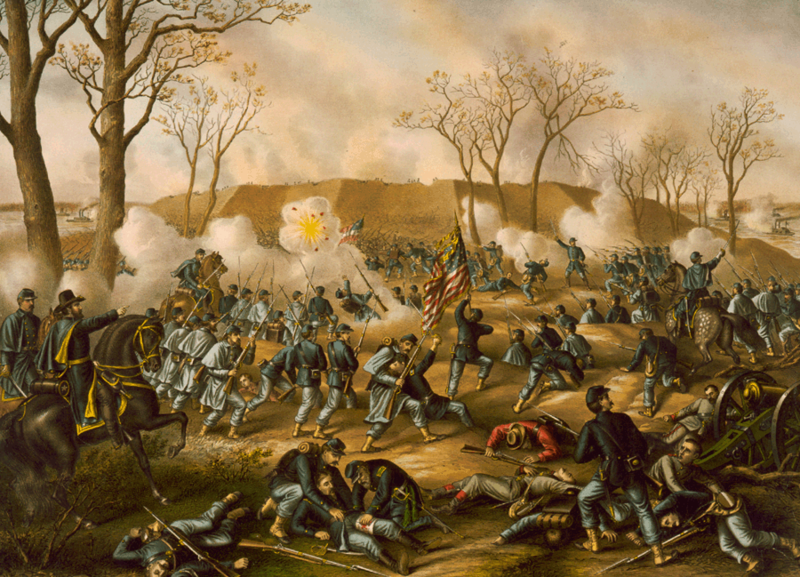 Grant thought the Confederate forces were too weak and demoralized to stage an offensive, and that turned out to be the worst mistake he made in the whole war. 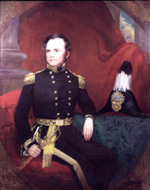 He was waiting for the arrival of reinforcements under General Don Carlos Buell before moving 20 miles south into Mississippi to attack the rebels at Corinth. That was where the Mobile & Ohio Railroad crossed the Memphis & Charleston Railroad (giving it a railroad importance of x squared). 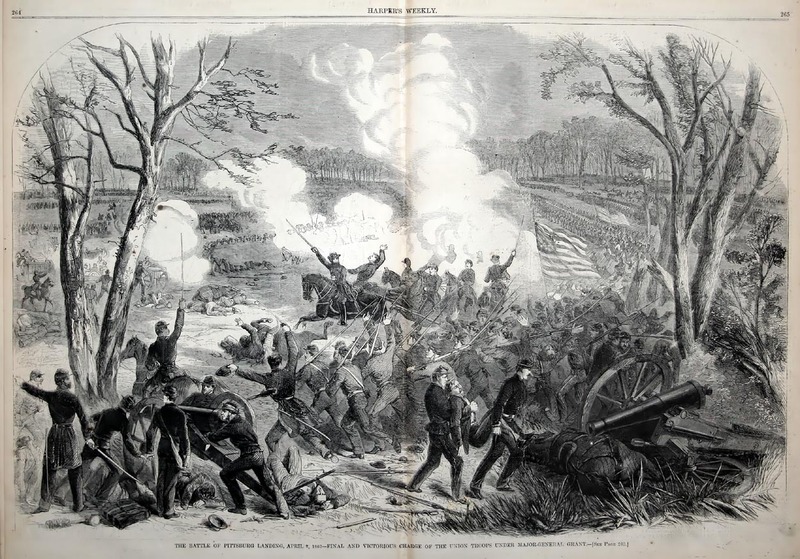 Grant’s opponent, General Albert Sidney Johnston, had 40,000 rebel troops there; Grant himself had 37,000; Buell had another 35,000, of whom 20,000 clean-faced soldiers would reach Shiloh to join their smoke-begrimed, blood-clotted comrades after the first day of fighting. Grant knew Johnston from the Mexican war (all of these gray and blue generals knew each other), so he probably should have realized that Johnston, a proud man, was burning for a success. 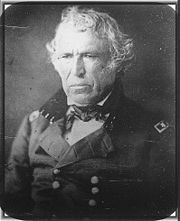 Johnston had recently come under criticism after his subordinates Floyd and Pillow had bungled the battle of Fort Donelson. 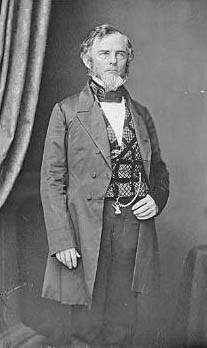 Throughout the long hours Grant had been moving incessantly among the cardinal points of the battlefield to talk with his division commanders. Those points had names that have taken on an allegorical flavor. The Peach Orchard, the Hornet’s Nest, the Sunken Road, Owl Creek. (Peach blossoms drenched in poison… the youth treads on the nest… the road sinks down and down… the owl flees the dark woods.) He had spent the night of April 6 under a tree in a drenching rainstorm. When he went to seek shelter in a small log cabin, he found that it was being used for performing amputations, and he decided he liked his rainy tree better. The next day, with Buell’s reinforcements, he and his troops once again fought desperately and finally pushed the Confederates back. * Quoted in Voices of the Civil War by Richard Wheeler (Meridian, 1990). **In Bread Without Sugar (W.W. Norton, 1992). This post is one of an occasional series about Ulysses S. Grant.